Revise Red Faction. Update Doom. Go back to the drawing board with that Total Recall remake (actually, please just stop making that). 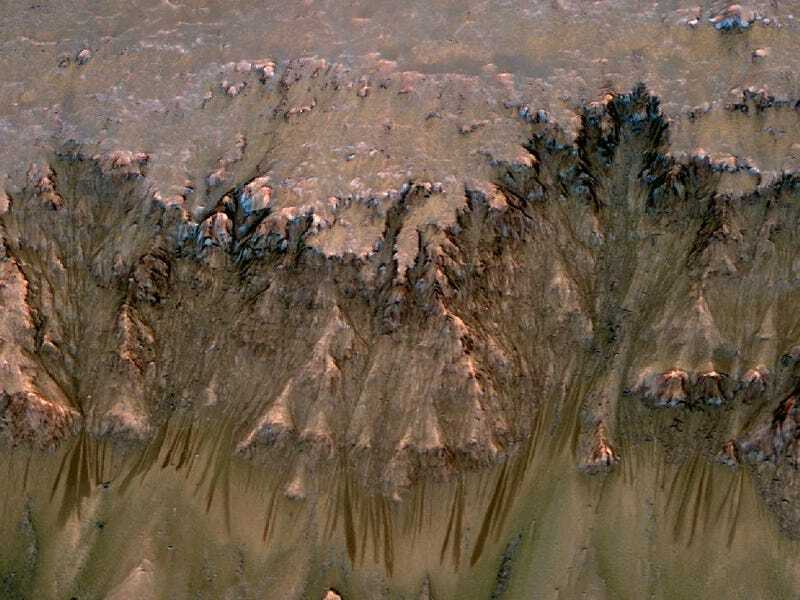 NASA announced today that they may have possible evidence of flowing water on Mars. "An image combining orbital imagery with 3-D modeling shows flows that appear in spring and summer on a slope inside Mars' Newton crater. Sequences of observations recording the seasonal changes at this site and a few others with similar flows might be evidence of salty liquid water active on Mars today. Evidence for that possible interpretation is presented in a report by McEwen et al. in the Aug. 5, 2011, edition of Science." A NASA report today says that the "dark, finger-like features" you can see in the photo appear during the spring and summer and fade in the winter. They think it means there's some sort of water flowing there. Read up, folks, and start inflating those inner tubes.